American Consumer News, LLC, 9780990530008, 198pp. Matthew Paulson is entrepreneurial to a fault. Through his company, American Consumer News, LLC, he has built a conglomerate of successful Internet businesses including American Banking & Market News (www.americanbankingnews.com), Analyst Ratings Network (www.analystratings.net), GoGo Photo Contest (www.gogophotocontest.com), Lightning Releases (www.lightningreleases.com) and Video County (www.videocounty.com). Matthew holds a B.S. in Computer Science and a M.S. in Information Systems from Dakota State University. He also holds an M.A. in Christian Leadership from Sioux Falls Seminary. 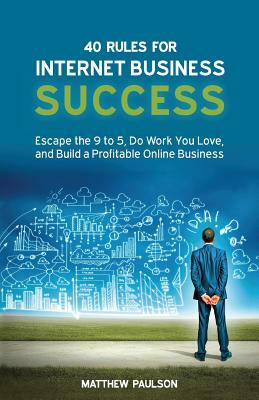 Matthew's first book, 40 Rules for Internet Business Success, is the culmination of eight years of building Internet businesses. He also blogs about entrepreneurship on his personal website at www.mattpaulson.com. Matthew resides in Sioux Falls, South Dakota, where he lives with his wife Karine and his son, Micah.